Gabriel and I spent a few days in Florida visiting our parents and we were starving when we got off of the plane in Fort Myers. His parents were nice enough to treat us to lunch at Pincher’s, which was a great choice. The menu was SO appealing- with a ton of seafood choices. 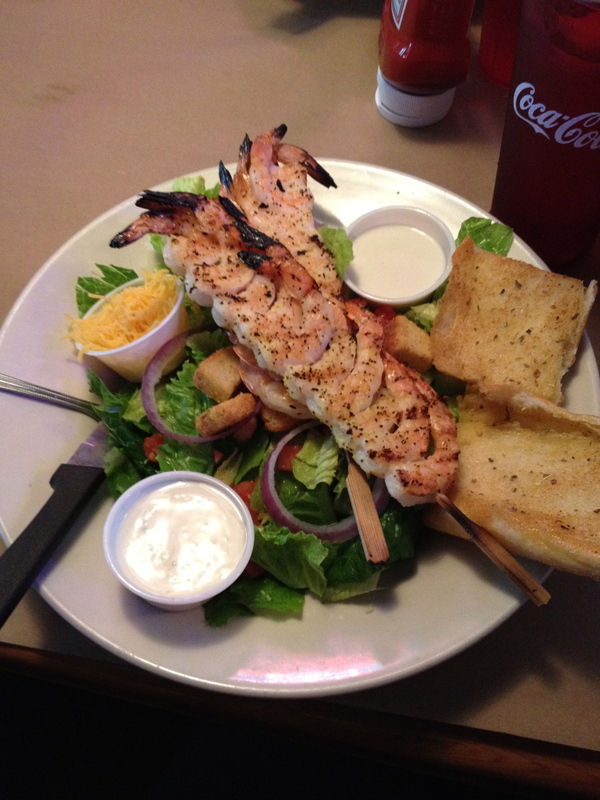 Wanting to start out the trip with a healthy choice, I ordered a salad with grilled shrimp instead of one of the many fried seafood options (but I did have a taste of the fried oysters which were awesome). There was enough shrimp on the skewers for 2 or 3 people and I happily gave some away. The vegetables were all fresh and the blue cheese dressing was chunky and creamy. I was quite happy with my lunch choice and easily cleaned my plate. I realized as we left that this was one of many Pincher’s locations and thought I would definitely go back to try some of the other items on the menu. As a New Yorker, I was especially impressed with the oyster prices- and surely plan to go back for a dozen the next time I’m in Florida.